Today we meet Rob (pictured above). 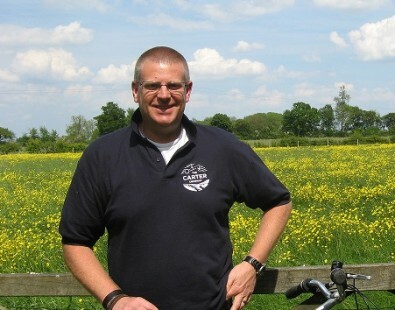 Rob is the host for many of our cycling and walking holidays in the Cotswolds and along the Thames. Born and brought up in Oxfordshire, Rob has a huge spirit of adventure and spent a number of years in the RAF where he lived and worked in several far flung locations across the globe. He is a very keen (some would say over keen) cyclist and adores bikes; he is passionate about history and meeting interesting people is what makes him tick. As a previous Operations Manager with The Carter Company, he knows all our tours and routes inside out, as he does Oxford where he lives. Wendy: Rob, hello! Can you tell us a little about your role as a host in the Cotswolds and Thames? How did you end up becoming a Carter Company walking and cycling holiday host? Wendy: What's your favourite thing about being a host in the Cotswolds and Thames? Rob: I think the excitement of clients! Both before their impending adventure and at the end of their trip when I often meet clients,as they are so happy and full of tales. They are always surprised at the number of villages they went through every day, the charming quirkiness of the accommodation and those staying in classic hotels comment on them exceeding their expectations. They are full of the special things they have discovered about the area for themselves.This is what makes my job so worthwhile! Wendy: Everyone has their favourite spots in the Cotswolds and along the Thames. Some are more crowded than others (!). In fact, getting away from the crowds is one of the big challenges for visitors during peak season. Can you recommend anywhere quiet in high season? Rob: Kingham is a delightful village where you can sit in the village pub looking over the green. Its peaceful and quiet and feels a million miles away from crowds or bustle. Along the river, I just adore the village of Kelmscott; again it has a characterful inn as well as the fascinating manor house where William Morris chose to live. Wendy: Do you have any advice for our readers who are thinking of visiting the Cotswolds or the Thames? Rob: Come in June and July when the summer is fresh. Don't rush - enjoy the journey and take all day as there's just so much to see. In the Cotswolds, remember that wolds means hills - not mountains, but the terrain is rolling. Wendy: And finally, if you could go walking or cycling anywhere else in the world, where would you choose and why? Rob: It has to be China!, the whole experience is so alien and utterly fascinating. And there's great history too. Nearer to home, I'd like to cycle in the Netherlands, just to experience their amazing network of bike paths and the cycling infrastructure they've built up. The UK is a truly unique place, and our ancient heritage often leaves strange reminders of the past. Amusing hang-overs from history often come in the form of names - here are our picks for Britain's funniest place names. With a different name depending on whether you are entering from the East or the West, this little village supposedly got its name in the 1400s after Yorkist soldiers insisted their beer be brewed again to make it, and them, stronger for battle. Despite being very small, theres a lot of history here. The village is a stop along our Hadrian’s Wall Walk, so remember to pop into the inn for some of the famous ale. With the longest place name in Europe, this small Welsh town has become rather famous for being near unpronounceable. Unsurprisingly, as you need a good grasp of the language to even attempt to say it, Llanfair has one of the highest percentage of fluent Welsh speakers in Britain. Taron Egerton, star of Kingsman, comes from Llanfair, and if you want to hear the name pronounced correctly, look him up on YouTube. Nestled in sleepy Worcestershire, Upton Snodsbury is a sweet little village easily mocked for its silly name. When it was founded, almost a thousand years ago, it probably seemed quite sensible. Recently crowned Britain’s third funniest place name, Boggy Bottom is a neat hamlet in Hertfordshire. ‘Bottom’ is of course a common name for places in valleys, or for road ends. Bogs too are common, and yet the name rarely fails to prompt a giggle. It’s the wonderful combination of the two that make this such a special place to live! Down in Dorset you will find the amusing village of Droop. If you are on one of our Dorset tours, you may be lucky enough to pass through Droop, and have a good laugh at its expense. The name really just means ‘outlying farm’, but that’s not very funny. Yorkshire has some great spots, but one of our favourites is Giggleswick – what a name! Found in West Yorkshire, near to the Lancashire border, this town is actually quite lovely, and has plenty of heritage. It is also the home town of several famous faces, including Richard Whitely and Anthony Daniels (C3-PO). 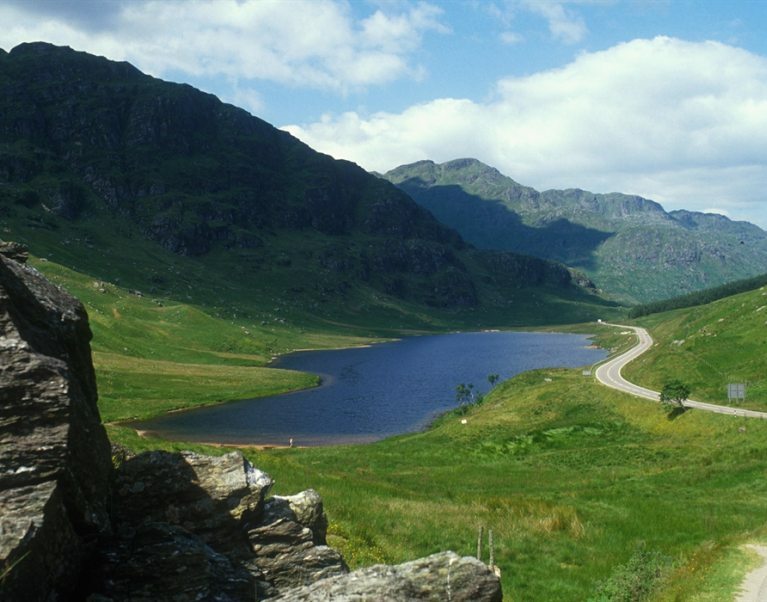 While barely a hamlet, Rest and Be Thankful in Scotland is a very special place. Theres an Inn and a postbox, but the real reason to Be Thankful is the phenomenal view. The picture above is of that very scene. As it’s difficult to give directions to places with such strange names, you are likely to have the view all to yourself. For more scenes like this, check out our Highland Coast to Coast tour. Beer is a village in Devon, situated on Lyme’s Bay. While the name isn’t actually derived from the drink, this hasn’t stopped the villagers from celebrating the supposed connection. Beer is really famous for stone, and stone taken from the quarries has been used to build some of the most incredible buildings in the UK, including St. Paul’s Cathedral. Scotch Eggs – A delicious savoury Scottish invention, the ‘Scotch Egg’ consists of a hardboiled egg encased in sausage meat and breadcrumbs. Today, they are a national favourite and can be found in pretty much every grocery shop – they also come in all sorts of varieties and sizes. If you want to try a more traditional one, we recommend seeking out a local farmshop. Ploughman’s – this traditional English lunch is simple but satisfying. As the name suggests, this is the typical country man’s meal, and has been for centuries. The ploughman’s is usually made up of celery, tomatoes and pickled onions, alongside fresh bread and butter. There is often a cold meat, hardboiled egg and local cheeses. As a platter of local prides, it’s pretty hard to go wrong with a Ploughman’s. Regional Cheeses – Of course, if you are travelling in the UK, it would be remiss to not try some of our wonderful cheese. Cheddar is a must, but you should also try Red Leicester, crumbly Wensleydale, and smoked Lancashire. If you like blue cheese, then you must try the famous Stinking Bishop. Cornish Yarg and Shropshire Blue are also very good! Welsh Cakes – known as Bakestones within Wales, Welsh Cakes are yummy little snacks made with cinnamon and nutmeg, and with raisins or sultanas. Though rare, they are sometimes served with butter or jam. Eccles Cakes – these are the northern English equivalent of Welsh Cakes and are similarly packed with fruit. Unlike the Welsh Cakes, they are lighter, often with flakier pastry, and are decorated with sugar. Bakewell Tart – invented in Derbyshire, the Bakewell Tart is made with a shortcrust pastry base, layers of jam and frangipane, topped with icing and almonds. The Bakewell Tart is the height of indulgence and is a beloved favourite around England. You can buy a big one to share, or little ones for afternoon tea. While readily available in supermarkets, you are better off visiting a good baker’s. Scones – debate is rife across the UK as to the origins of the Scone. The scone has been claimed by practically every region down to Cornwall, with each having their own twist. 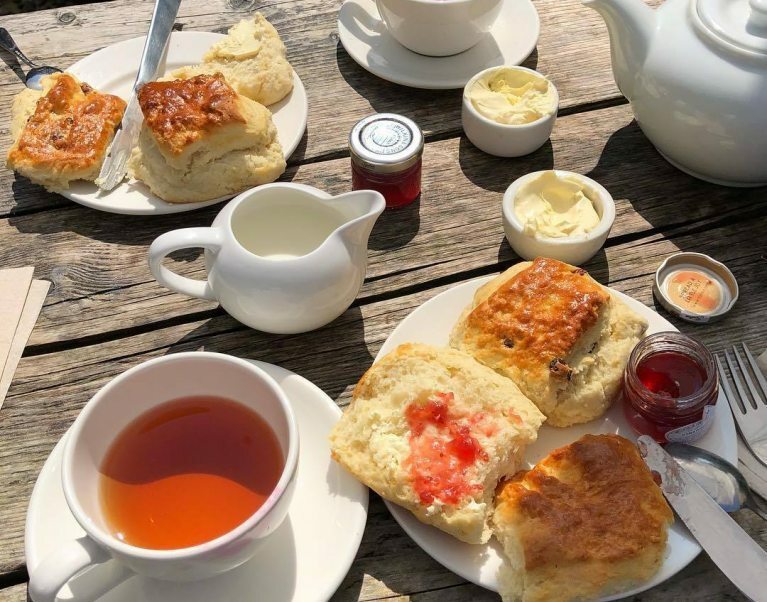 It is most likely, however, that the Scone originated in Scotland, and was named after ‘Scone’, the area where monarchs were traditionally crowned. While technically Scottish, the Scone is the ultimate English afternoon tea treat, and is must when visiting the UK. If you don’t believe the controversy over scone, check out this Independent article about the Cornwall versus Devon argument, which had to be settled by the Queen! We have picked out some of our favourite beaches from across all of our tours, to help you get more excited for the summer. If this heatwave continues, then the beach will be the place to be! Several beaches border the Cornish town of Bude, and all have their own charms. Some stretch out, perfect for sandcastles and picnics, while others, such as Crackington Haven, attract surfers and sailors. There is no chance of disappointment here; the beaches at Bude are some of the best in the UK, and have won awards for their beauty. Widemouth Beach, a little outside the town of Bude, is perhaps the best of all. As its name suggests, this is one of the bigger beaches in the area, and rarely gets too busy. As it is a little removed from the centre, it has a wilder and more untouched feel, perfect for those who also want to spot some wildlife. Learn about our Cornwall tours on our website. The image of Mont Saint Michel, the castle in the sea, is well known around the world. It is one of the most stunning sights, and is a world favourite. As well as great history, this area has some spectacular beaches where you can look out at the island. Famously, the island is accessible as the tide goes out, and the whole area becomes one great beach. Do be careful to check the tide times when you go out however! Our tour of Brittany’s Emerald Coast is one of the best for those searching for a calm and cultured beach trip – take a peek at the website, every stop on this tour makes for the perfect beach summer holiday. The white beach of Nossa Senhora sits at the base of the cliff fort, and is the perfect place to relax and watch the waves while working on your tan. However, the best bit of this section of the Carvoeiro coastline is the boardwalk, which will lead you along to the incredible rock formations of Algar Seco and Boneco. The walk is made up by a wooden walkway on the rocky clifftops, giving you great views over the sea and the unique geology of the area. Taking the time to walk down to Algar Seco is a must – the dramatic sea arches and stacks make for some pretty stunning photographs. Also worth exploring is the Boneco caves, which are fascinating, if a little spooky. After you have done Algar Seco, you can simply walk back to the beautiful beach, get a drink, and choose your favourite photos for Instagram! Find out more about the wonders of the Algarve on our website. 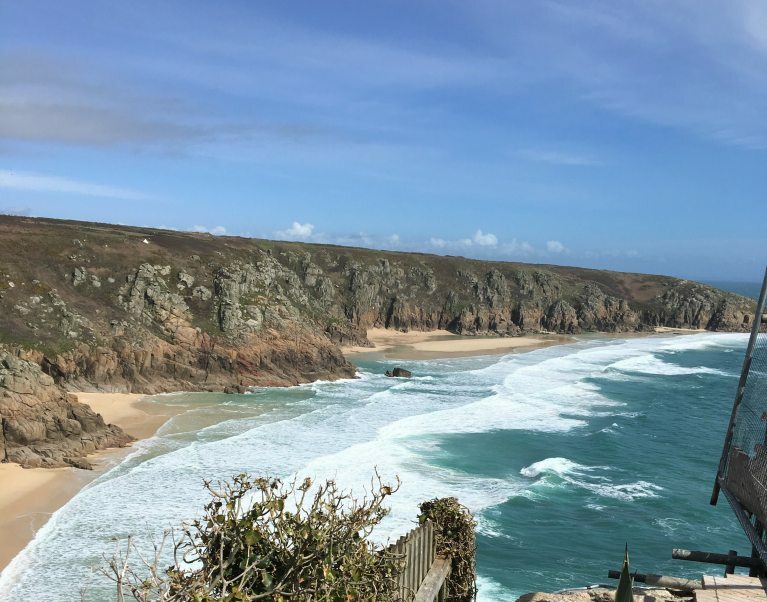 Cornwall is the favourite holiday destination of Brits and promises everything you could possibly want from an English beach vacation in addition to its history, stunning scenery and a lot more too, We’ve highlighted some of our favourite spots and lesser known gems from our recent research trip there - 2019 sees the arrival of our new E bike cycling holiday in Cornwall. St. Ives is one of the most visited places in the county, and that’s hardly surprising considering its perfect picture-postcard and full of seaside charm. Its narrow streets are often packed, but that doesn’t detract from this Cornish gem. St. Ives is also home to the most southerly branch of the Tate Modern museum. Slightly tucked away, although close to Tate St. Ives, is Portmeor Beach. On the north side of the town and here, overlooking the sands and with stunning sunset views, is Porthmeor beach café. Even better are the outdoor ‘carriages’ – wind sheltered seating for 8/10 in your own private alcove around a table, fitted with heaters and blankets available, allowing you to look out over the beach and the sea in ultimate comfort. It comes no better than this, and the food is rather good too. The most popular walking trail in the UK is the South West Coast Path which extends for over 600 miles and runs along the North and South Cornish coasts. Where to start? We think one of the most idyllic sections is on the south coast, either side of the Helford estuary known as the Helford Passage. Two stunning gardens at Durgan and Trebah bless the route with an ancient and magical ferry linking two classic Cornish pubs on the crossing over the Helford River. With romantic names such as Gweek Creek, how could you not fall in love with it? Cornwall has the warmest and mildest weather in the UK and consequently, but few know it, there is quite a pedigree of wine production. Award winning Camel Valley Winery offer guided tours and tastings, whilst Knightor Winery offer tutored tastings. Polygoon Vineyard near Penzance is also a must visit location. All have online shops for ordering their excellent wines. If you must visit Lands End, then do so by walking or cycling the Sustrans cycle route 3 from delightful Senneh Cove, thereby avoiding the ridiculous car park charges. In the handful of miles you will get a real sense of the magnificent landscape surrounding Britain’s most south-westerly point. Cornwall has many tiny coves, some quite difficult to access. One of our favourites is the secret cove near Cadgwith where a rope is in place to lower yourself onto the deserted sands. If its peaceful paddling you seek, this is the place. Rock and Padstow were always fun and busy, and are even more so now that Rick Stein’s foodie haunts have opened. For an oasis of calm, close to but not in Padstow, look out for the opening in 2019 of the latest Pig Hotel at Harlyn House. St. Endellion has two rather special music festivals each year based in the local church. Musicians, organisers and cooks give their services free as the aim is to create the best festival possible on the smallest possible budget. The music is thrilling. There are many small entrepreneurs and artisans now in the county – running cafes and restaurants, art and craft galleries, micro-breweries and artisan spirits, and the list goes on. Head for ‘The Cornish Store’ in Falmouth to find a great selection of local products. 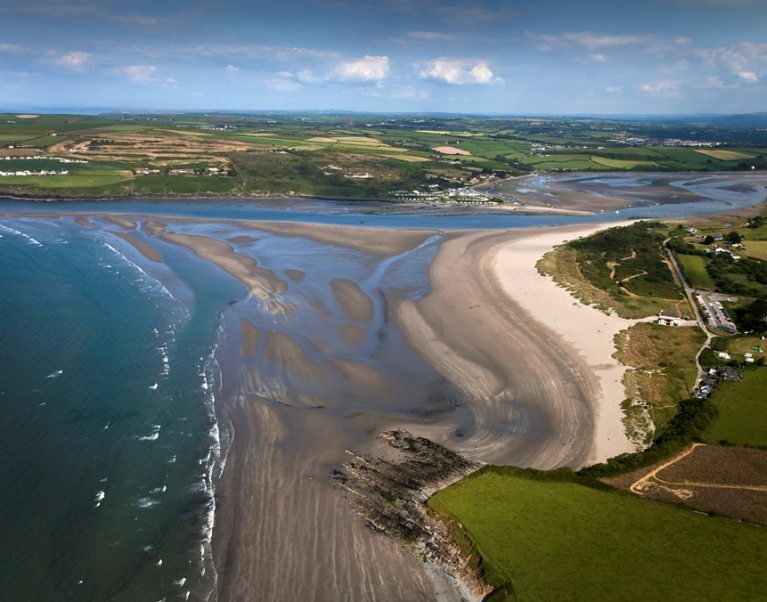 The Camel Trail is one of Britain’s most popular cycling routes with the flat section running 11 miles on a disused railway line along the beautiful estuary from Bodmin to Padstow. The best option is to start your riding at the head of the trail on Bodmin moor, where far fewer venture, and free-wheel the six miles down the fledgling valley to reach Bodmin. Not only will you likely have it to yourself, but you will experience the moors, receive a geography lesson in the development of river valleys, and enjoy one of Britain’s best Norman churches at Blisland before pedalling along the flat section. Being the most westerly county in the country, it takes awhile to get here. We suggest you let the train take the strain and travel overnight on the Night Riviera Sleeper from London. It’s not cheap but you are getting a night’s accommodation. As well as the hand-crafted tours available on our website, we are also able to arrange holidays to order - just get in touch and we will help you design your dream break.